Documents the true story of the nineteenth-century rediscovery of the Mayan civilization by American ambassador John Lloyd Stephens and British architect Frederick Catherwood, illuminating how their findings profoundly changed Western understandings about human history. Relying a great deal on John L. Stephens's own account of his travels to Central America, Jungle of Stone praises Stephens's writing as conservative, successfully resisting romanticizing and needless embellishment, sticking to the facts, and, importantly, giving credit to explorers who came before him, while capable at the same time of capturing the reader's interest with the fluidity of the prose. The same could be said of Carlsen's book: while offering a concise retelling of J.L. Stephens's and Frederick Catherwood's Mayan quest and its aftermath, the author contextualizes the narrative with the help of meticulous archival and field research. Carlsen draws on sources ranging from civil records, newspaper articles, extant correspondence, histories of conquest and exploration, diplomatic records, biographies of other contemporary players, published and unpublished accounts by other explorers, ship passenger lists, publishers' account books.... etc. to find small nuggets of information which are deftly woven into the story, often in support of new biographic discoveries. Unlike a previous reviewer, I didn't feel at all "bogged down" by the details of Central American warfare: what we get is a necessary context helping us to understand the dangers encountered and the unstable political situation which Stephens, as an appointed U.S. diplomat, had to navigate during his first journey to Guatemala. Without this background, the story would have been incomplete. Stephens and Catherwood first traveled to Central America in 1839, taking advantage of Stephens's official diplomatic mission. Landing in British-governed Belize, they pursued their journey, by water and land, amid mudslides and rebel factions, to Guatemala city, first making a difficult detour via Copan, their first encounter with the Mayan civilization. Stephens was unable to indulge his interest in "antiquities" (as archaeology was referred to in those days), and had to do what was necessary to fulfill his mission: which included attempts at finding the elusive Guatemalan government, meeting with both Francisco Morazán, the president of the Federal Republic of Central America which was in the process of breaking down into separate territories, and the rebel Rafael Carrera who waged a persistent guerrilla war with the support of local population against the colonizer. It is amazing that Stephens managed to get on the good side of the two sworn enemies and come out alive from the encounters. Without getting some understanding of this important chapter in Central American history, I don't think we can really understand what it meant to travel across the territory in 1839/40. This perseverance characterizes both Catherwood's and Stephens's approach throughout their encounter with the Mayan civilization. They were the first explorers to approach it without any preconceptions and start from scratch, from simple detailed description, before venturing any hypothesis about the meaning or origin of Mayan art. Both seasoned explorers who traveled across Egypt and the Middle East, as well as Greece, and throughout Europe, they quickly discarded the hypothesis that the Mayan civilization was an offshoot of one the early Mediterranean cultures. Once again, Jungle of Stone does a good job placing their research in context and, beyond the rival Caddy and Walker expedition, presents earlier attempts at exploring, describing and theorizing about the Mayan ruins. Readers interested in exploring this topic further are offered an exhaustive bibliography -- if it has any gaps, it's that it does not mention that the main primary resources are available on archive.org: all four volumes of Stephens's Incidents of Travel... (the first and second expedition), as well as Catherwood's Views of Ancient Monuments... which includes his colored drawings (although only those in brown tones, not the full color hand-painted plates from the limited edition reproduced in the plate section of Jungle of Stone). Also available on archive.org is the very-limited edition of Antiquities of Mexico (9 vols.) compiled by Lord Kingsborough and published in 1831, which include some color drawings of the Mayan architectural motifs. On a final note, among the interesting facts I learned about the Maya art was that when applying layers of plaster to their figures, they literally "dressed" them "as though they were real humans": "each layer was painted even though it was to be covered with another layer of plaster" [p. 262]. 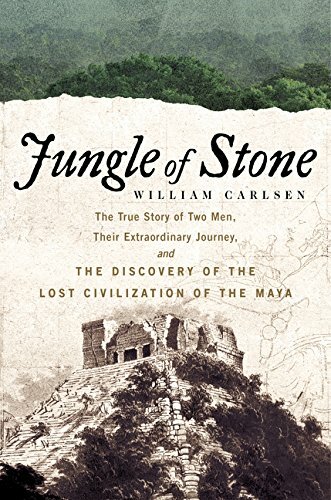 Jungle of Stone is a dual biography of John Lloyd Stephens and Frederick Catherwood who are famous for having discovered Maya ruins in the jungles of Guatemala and Mexico in the 1830s and 40s and published two very popular travel/exploration books that remain in print to this day. Stephens was the leader and author, Catherwood was the artist. The book itself is a biography so it ranges to include Stephens and Catherwood's trips to the Middle East, Panama, Russia, South America etc.. the trips to Guatemala and Mexico form the core but its bracketed with other journeys. William Carlsen is a long-time reporter who lived for many years in Guatemala. He has done a great job restoring the memory of once famous explorers, reviving a sense of first discovery of a lost civilization.